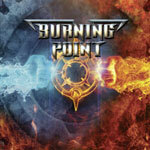 Burning Point's new eponymous album comprises 6 re-recorded classics off the band's initial 3 records and also 5 new songs including a cover version of Kiss' I've Had Enough (Into The Fire). This effort serves as a fresh start in order to introduce former Battle Beast vocalist Nitte Valo to the band and I think her voice goes down well on both the new and the older material and I definitely support this change of vocalist. The re-recorded stuff comes out fresh in their current versions and I think that the band is able to set things into effect with the new tracks as well.